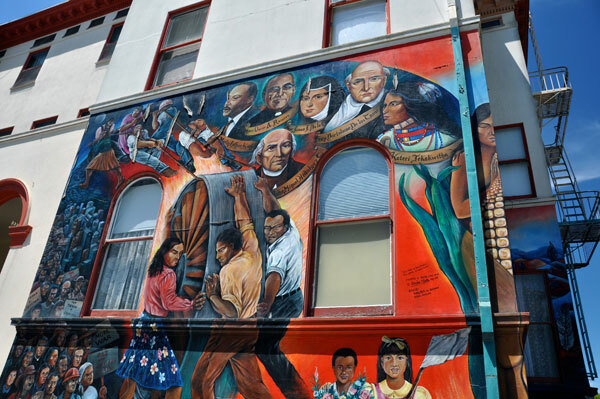 While the San Francisco Bay Area is amply dotted in brightly colored, provocative art, famed muralist Ray Patlan recommends that visitors start in San Francisco's Mission District if they want to experience a close collection of established and exciting mural artwork. 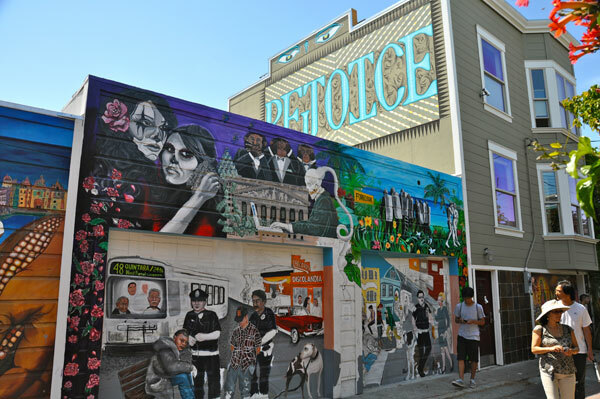 The Mission District's Balmy Alley and Clarion Alley offer visitors the tightest concentration of murals in the city. The two alleyways are about a 25-minute walk apart from one another, and there are about 40 or so murals contained along each narrow street. Plus, the wall art isn't limited to just the alleys, but adorns the walls along the adjoining streets — depicting joy, politics, history, injustice, family and sheer frivolity. "In terms of street art, the area is a museum," Patlan said. Mural on Balmy Alley. Photo by Deston Nokes. Seeing the artwork first-hand is nothing short of dazzling. 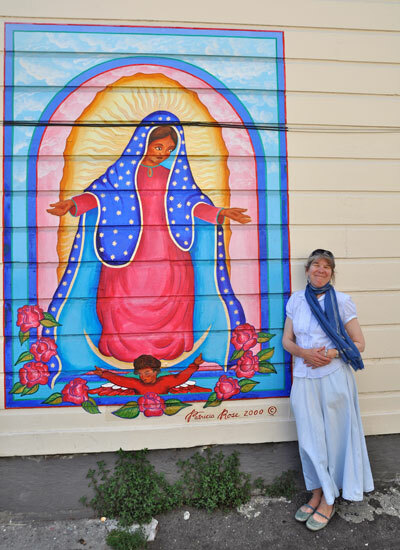 We took an inexpensive ($15) walking tour of the Mission District's murals with artist Patricia Rose at Precita Eyes, a community-based mural arts organization located near Balmy Alley. Taking a guided tour isn't mandatory, but I found that having a muralist explain the pieces made for a more enriching experience. Patricia Rose by her mural in Balmy Alley. Photo by Deston Nokes. Our two-hour tour started with an old-fashioned slide presentation that took place in Precita Eyes' kaleidoscopic shop and quickly covered the history of murals, from caves to the Egyptians, to Michelangelo's Sistine Chapel, to Mexico's golden age of muralism in the early 1920s, featuring the "Tres Gigantes" (three giants): Diego Rivera, José Orozco and David Siqueiros, who gave the medium a style and relevance that endures today. 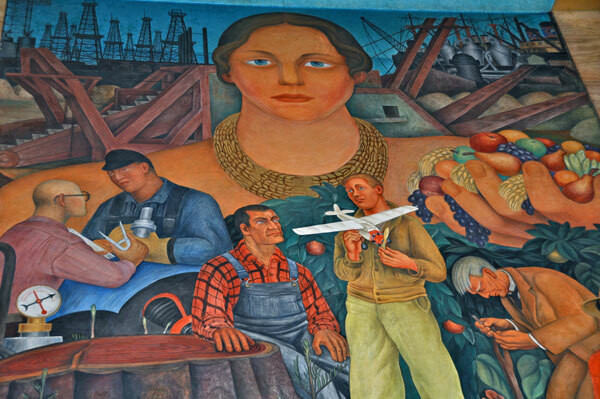 Rivera has held great influence over local muralists, particularly since there are four Diego Rivera murals in the Bay Area, including Pan American Unity, at San Francisco City College; The Making of a Fresco Showing the Building of A City, at San Francisco Art Institute; and Still Life and Blossoming Almond Trees, in Stern Hall at the University of California, Berkeley. Detail, Allegory of California. Located in the City Club of San Francisco, Diego Rivera created his first U.S. fresco on the wall and ceiling of the grand stairwell. Photo by Deston Nokes, courtesty of Stock Exchange Tower Associates/The Empire Group. 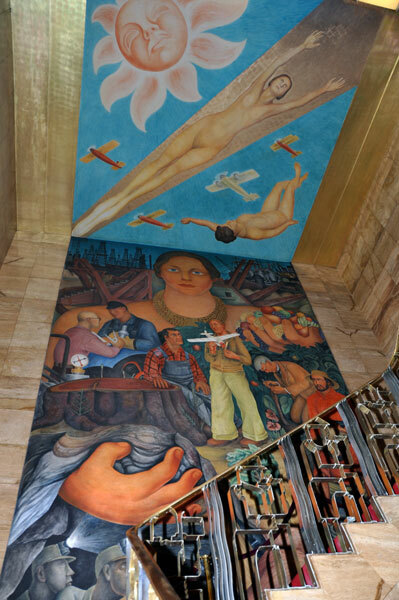 Rivera's first San Francisco mural, Allegory of California, is found in the City Club of San Francisco, located on the 10th floor of the Stock Exchange Tower at 155 Sansome, corner of Pine. It is open for public viewing between 3 p.m. and 5 p.m. daily. "Rivera painted authenticity into his murals," explained Rose. "As the murals moved outside, the themes shifted to ordinary people and life, rather than heroics. Male muralists depicted scenes of struggles and issues. Women muralists pioneered life-affirming, positive themes in their work, such as home, heritage, family and community." Another giant, David Siqueiros, helped the increase longevity of outdoor murals by working with a chemist to create the formula for acrylic paint. Acrylics hold up well outdoors and have a strong pigment. Precita Eyes sells mural paint and supplies in addition to posters, buttons and books. NAYA BIHANA by Martin Travers. Photo by Deston Nokes. 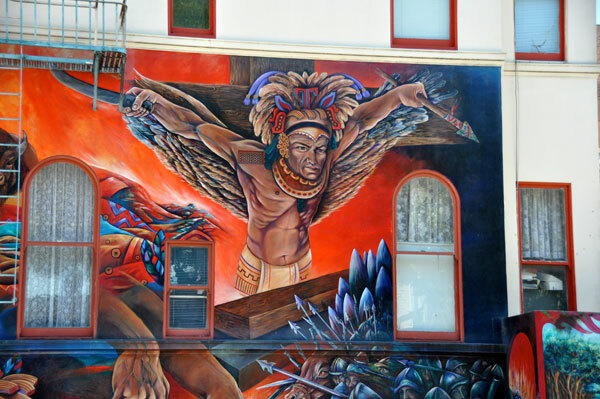 How did the Mission District become such a rich magnet for street art? "The Mission is the area of newcomers," said Rose. "Over the decades it has changed ethnic hands from German, to Irish, to Italian and to Mexican. In the 80s, it saw a Central American influx, which speaks to a lot of the political content in some murals. 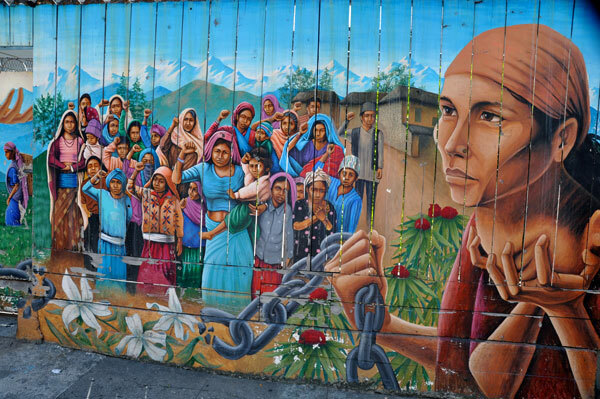 There are paintings along Balmy Alley that speak to wars in El Salvador and Nicaragua, and even the struggle in Nepal." 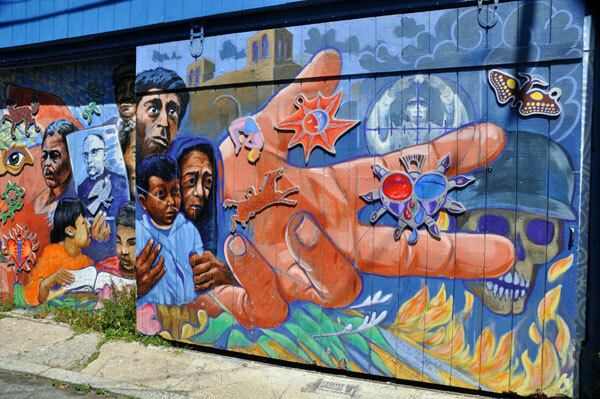 Today, the Mission is 70 percent Latino and many of the murals depict Mexican history and culture. However, many artists are migrating toward aerosol, calling it a freer form of painting. 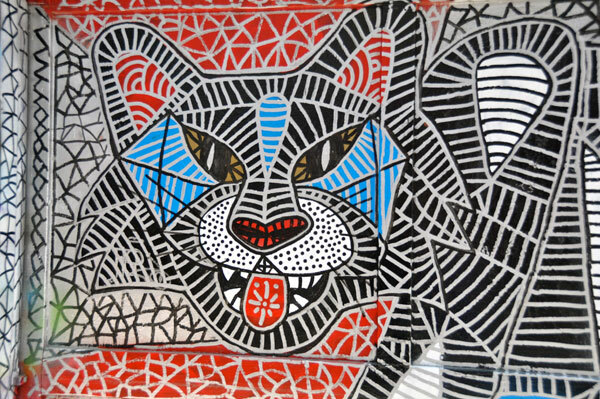 This style is more heavily used in the murals along Clarion Alley. Artist and instructor Ray Patlan tells his students that it "doesn't matter how or what you paint, whether it's political or abstraction — as long as you're sincere about what you do, it will come out in the images." Tribute to Archbishop Oscar Romero by Jamie Morgan. Photo by Deston Nokes. My friend, Lynne Blair, and I sat with Patlan at Otaez Mexican restaurant in Alameda, sipping café con canela (cinnamon) and eating a hearty plate of machaca con huevos, a breakfast concoction of eggs, peppers and shredded beef. Now 66, Patlan teaches at Laney College and The California College of the Arts, both in Oakland. Raised in Chicago's Pilsen neighborhood, Patlan became inspired by mural art from his trips to Mexico with his mother and father. There he drank in the brilliance of the great muralists of the age: Rivera, Orozco and Siqueiros. "I decided that if the murals could be so powerful there, why not in Pilsen?" he said. He bought $70 worth of paint and began creating murals in Chicago. Ray Patlan. Photo by Deston Nokes. While attending the Chicago Institute of Art, his instructors dismissed his work as ‘billboard art.' "In the late 70s, lots of teachers were influenced by the Rhode Island School of Design and were into conceptual art," he said. "Murals weren't considered relevant." 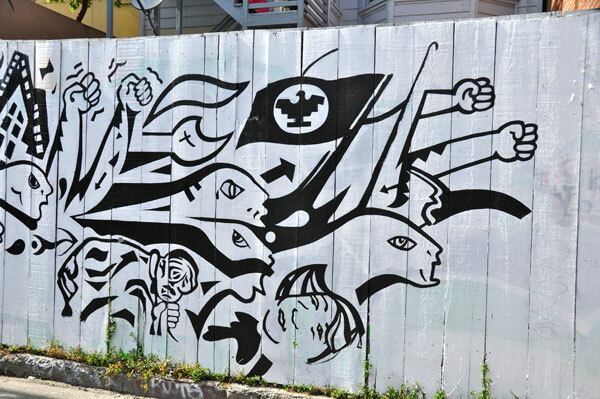 While "trying to paint his way out of poverty," he found that the University of California, Berkeley was willing to hire him, and he immersed himself in the Bay Area's lively mural movement. He has directed and/or created more than 100 murals in the United States, Mexico, Asia and Europe, and keeps a finger on the pulse of mural making in the area. 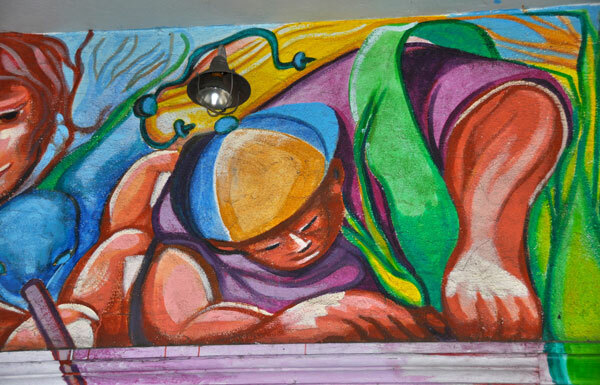 Patlan even has his share of mural work in the Mission, including the façade of the Head Start building. Ray Patlan's mural outside Head Start. Photo by Deston Nokes. Which artists is he watching now? Patlan took us to the immense colorful mural by Estria Miyashiro, Water Writes Mural, in downtown Oakland on Broadway and 21st Street. As with many huge murals, it's a collaboration of painters under the direction of the artist. 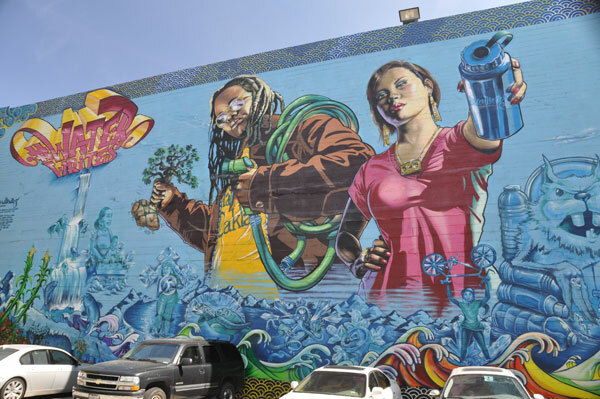 Another Patlan favorite is Mona Caron, who has exceptional murals in San Francisco, including Windows Into The Tenderloin at Jones Street and Golden Gate Avenue in San Francisco, and her 340-foot-long, 18-foot-high opus, Duboce Bikeway Mural on Duboce Avenue between Church and Market Streets. Water Writes by the Estria Foundation. Photo by Deston Nokes. I asked Patlan what he regarded as the main difference between easel art and murals. He said that he had learned that answer from one of the masters, David Siqueiros. "I visited Siqueiros many times before he died," Patlan said. "As long as I could, I asked him questions about murals that would help me later. "He told me that the with easel art, you can hang it on the wall, turn it upside down, and move it anywhere you want. Murals are part of the architecture and the environment. It is the environment. If you walk up to it, you psychologically walk with and into it, and dance with it." Allegory of California. Located in the City Club of San Francisco, Diego Rivera created his first U.S. fresco on the wall and ceiling of the grand stairwell. Photo by Deston Nokes, courtesty of Stock Exchange Tower Associates/The Empire Group. 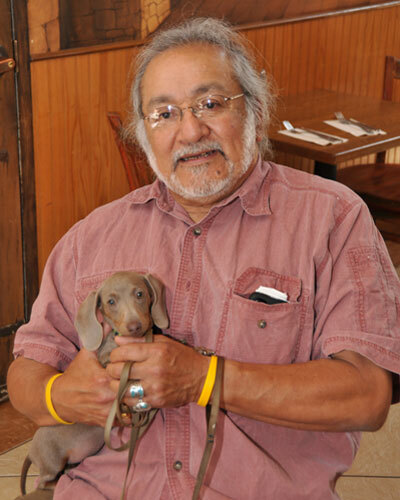 Our America: 500 Years of Resistance, by Isaias Mata. Loacated at St. Peter's Church on 24th Street near Florida. 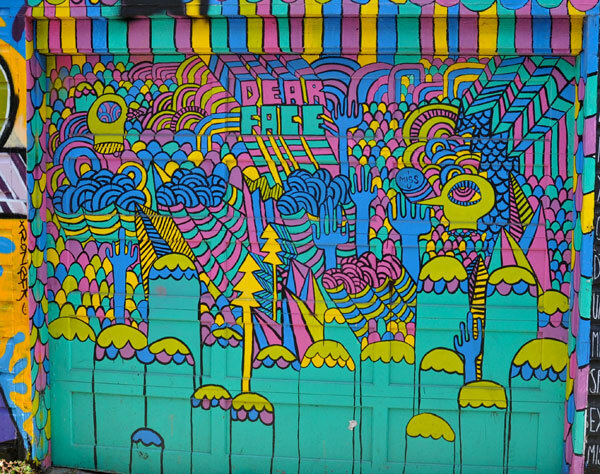 Mural on Clarion Alley. Photo by Deston Nokes. Each tour features different murals and are conducted by muralists. Reservations aren't required for their most popular weekend walking tours, but they do offer private tours, group tours, bicycle tours, bus tours, and customized tours by appointment. Balmy Alley: Take BART to 24th/Mission. The alley runs parallel to Treat Avenue and Harrison Street between 24th & 25th streets. Parking is a nightmare, so public transit is your best bet. 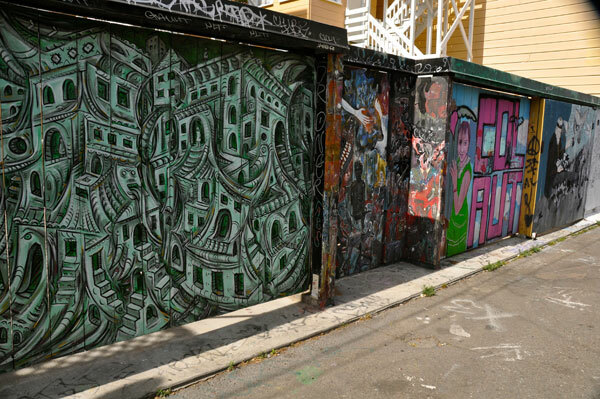 Clarion Alley: Is located between Mission and Valencia Streets, and 17th and 18th Streets. It's about a 25-minute walk from Balmy Alley.